Does anybody else remember the Open Sky Cafe down by La Linda? These memories are a little fuzzy due to time, but some of my best ever memories of the Big Bend/Black Gap experience. This story takes place sometime between 1985 to 1990, can't get it closer than that. And it could possibly be the Blue Sky Cafe instead of the Open Sky Cafe, but I'm going with "Open" unless corrected. Years ago, when La Linda, Mexico was still an active fluorspar mining town, actually just a small community, there was a little, and I do mean little, one room "cafe" that opened on the Adams Ranch, down at the end of FM 2627, along with a bunkhouse type structure. I first found out about it it due to a note posted on the front door of the Stilwell Store, advertising the "Cowboy Special", no description given, at the Open Sky cafe, again down at the end of FM 2627. I was camping in Black Gap Wildlife Management Area at the time, with side trips back to Big Bend occasionally to do some of the shorter hikes, like Mule Ear Spring and Burro Mesa Pouroff. Well, I was tired of my own cooking at the time, and this sounded like a welcome change of pace, as well as an adventure. I was still newish to visiting this part of the world, and everything was an adventure. So I drove down to the river and made the right at the dirt road leading up to the Open Sky. I believe there was a sign directing you to make the right turn, though there was really no other choice. There was a small building with a rustic sign saying "OPEN SKY", and a series of other structures off to the right, which I learned later were the guest bunkhouses. I went inside, and was immediately struck by the "tinyness" of the place. 2 tables as I remember, as you entered, and a small kitchen area in the rear. A very cowboyish, for lack of a better term, individual introduced himself to me as Justin. The story as I got it from Justin was that he had been a real cowhand on the Adams Ranch, and as he was getting too long in the tooth to be a cowboy, didn't drive, and had no place else to go, the boss decided to open this place, to try to get some of the River floaters and boaters to put in and eat, and maybe spend the night at the bunkhouse. And of course Justin was the chief cook, clerk, and bottle washer. As Justin prepared my Cowboy Special, which was a sort of skillet, with sausage, eggs, potato, onion, tomato, and possibly a few things I didn't spot, he regaled me with questions about what was going on in the world. And he had opinions about everything I mentioned. He told me a few stories about being a cowboy down in that country. One I particularly remember was about taking turns being cook. He said that cook duties rotated amongst the cowboys, but if anybody complained about the cooking, the complainer was immediately the new cook. He said you learned to say things like "Cookie, these beans are terrible........pau se for effect..........but I like 'em!" I enjoyed this experience immensely. I don't remember any silent moments, he really liked to chat. He told me about the one family living in La Linda across he river. He knew all the children's names, I seem to remember about eight. Apparently, except for whatever mining staff was in La Linda, and a troop of Mexican cavalry, as he put it, there was just this one family in residence. As I departed, I was thankful about this novel addition to my annual Big Bend/Black Gap area trip. Unfortunately, when I returned to the Open Sky the next year, I found it in the hands of a younger guy, who said he and his partner were now running it, as Justin had gotten a new job standing bear watch for people in the area. Apparently the black bears in the area were breaking into buildings looking for food. The guy's partner was off to Alpine to get supplies, and there was a large stack of dirty dishes in the sink. He told me about a party they had had last night with some of the Mexican troops from across the river. He didn't seem too interested in doing any cooking, and I didn't insist. I left mildly disappointed that I hadn't run into the personable Justin again. During this same time period I had the pleasure of meeting and chatting with Hallie Stillwell, who I ran into sunning herself on the front porch of the Stillwell Store. She graciously autographed a copy of her book 'I'll Gather My Geese" for me. Any visitors to the area should definitely make a point of visiting the Hallie Stillwell Hall of Fame Museum, adjacent to the Stillwell store. Sadly, the Open Sky Cafe is no more, but it was a great one-time experience. Re: Does anybody else remember the Open Sky Cafe down by La Linda? That is an amazing story! Exactly the kind of thing I was hoping you would contribute here. Sadly I have not even been down to the end of the road to La Linda. Thanks. Great story. Time just runs through our fingers like water, doesn't it? Make you wonder what we take for granted today that will be gone tomorrow. I've been been running this over and over through my memory banks, and I realize that the mining must have been already shut down in La Linda on my second visit, because the concrete barricades were up on the bridge. I didn't remember having seen them the previous year, though they could well have been there and I just didn't notice. Wish I could be more specific on the year, but haven't been able yet to narrow it down further. It must have been later than '85, because that's when I first started visiting the area, and then the big trucks were rolling through carrying the fluorspar to market wherever that was. When I commented on this to the guy at the Open Sky, he said "Clothes". He told me that "they" knew where, and he named a couple of big name retail stores that I won't repeat because I don't know for a fact it was true, disposed of last year's unsold clothing, and these people retrieved it and smuggled it into Mexico. He said that as long as the jefe of the Mexican troops stationed at La Linda got his piece of the action, it all ran very smoothly. He also mentioned that he barbecued on occasion for the Mexican troops, and a couple of times he had been invited to go on drug raids with them. When I said I had always thought the Mexican law enforcement wasn't too serious about enforcing any kind of drug laws, he told me that true enough they considered marijuana a cash crop, but were deadly serious about anything else. One of the supplies this guy's partner was to pick up in Alpine was PVC glue, the smelly stuff you use to glue sections of PVC water line together. Apparently they had had a leak in one of the lines to or from from the water heater on the site to wherever it was piped. So they dug it up, found the leak, and because they didn't have any PVC glue, they had joined the new sections of pipe together using plumber's putty. If you've ever done any PVC work, you know this is NOT going to work under any kind of pressure at all. As they apparently found out quickly. Come to think of it, this may explain the stack of dirty dishes in the sink, and why he didn't seem interested in whipping up a Cowboy Special. I forgive him now. At the time I was a little bit miffed. I had driven all the way here from my campsite at the time, Paint Gap 3 in Big Bend, over 60 miles or so away, and had saved my appetite for the occasion. Anyway, the last few years when I have driven down to the La Linda crossing, it has been eerily quiet and not a person to be seen, hard to believe it was once such a happening place. Some friends and I did a multi-day canoe trip through Boquillas Canyon in late December 2005 and took out at Heath Canyon Ranch at the end of FM 2627. We left our trucks at the ranch and camped there the night before the Terlingua outfitter picked us and our gear up to put in at RGV. 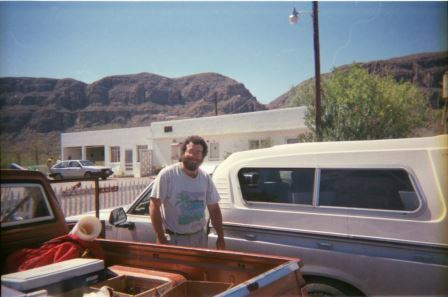 We met and talked with Andy Kurie that evening and learned some of the history of the fluorspar processing operation at La Linda and Andy's involvement with it as a geologist and how he'd purchased the Heath Canyon Ranch property after DuPont ended the La Linda operation. I remember walking around the property and exploring the old airstrip, etc. and one of the buildings having a sign on it reading Open Sky Cafe. It wasn't open. In general, there didn't seem to be much going on at HCR but it was an interesting visit with Andy, nonetheless. I searched my BB photos and have some of the airstrip at the ranch, the blocked bridge, and the the ranch sign on the entrance gate but none of the cafe. I know Andy passed on a few years ago and that Fred apparently still runs river shuttles but I don't know if HCR was sold or what became of it. Sadly, I believe Fred Keller died recently. Check this thread. My memory may be unreliable on this, but I believe my brother and I ate there when picking up the other vehicle after a lower canyons trip in October '94. I have this picture that I believe was taken there - can anybody confirm? I also not too long afterwards knew a guy named Mike Arent (?) who said he had worked there and spent lots of time across the border there. After further research I find that it was indeed the Open Sky Cafe. It and Heath Canyon Ranch were both trademarks registered to Andrew Kurie. Yes, sad. I had hoped to talk with him sometime on a visit to BB. The night in late December 2005 when we camped at HCR before our river trip, Fred's house or trailer across the road and atop the hill had loud music blaring from it. We met him briefly when we took out after our trip and I remember him saying he "worked security for the Ranch". I always envisioned him as an eccentric loner and wondered what his story was and what life was like for him. I've never even been to Hallie Stillwell's store. I see the road and wonder what's there but, most unusual for me, I haven't gone to see.